Jaltarang, Jal Yantra, Jalatarangam or Jalatharangam is a unique instrument in the sense that it is both a percussion as well as non-percussion instrument. 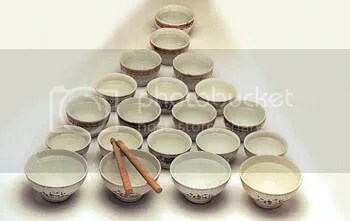 Basically, it is a series of china clay bowls of descending size laid in a circle, or row or any other convenient configuration. These bowls are tuned to the notes of the Raga being played by adjusting the amount of water held in the cups. When struck with chop-stick like strikers, these bowls produce very sweet chime or tickle like sound and can be used to play solo as an accompaniment of Tabla, or as an accompanying percussion instrument, mostly seen with Kathak style dance music. Now a days wehardly hear the jaltarang sounds. You are giving us the Blessings of Music. What else. I am listening repeated to Vathapi Ganapathim Bhaje and do not really know how many times I heard so far. I still need to listen to others. But not able to shift from this composition. I pray all the Gods and Goddesses shower their blessings on you and your family. what is Jingala Raaga ? Have not seen any post since this. May you continue to patronize Indian Classical Music. Not only is this beautiful music of Jalatarang a welcome lilting sound, but it is also played by artistes who are adept and well-accomplished! Good to hear such sounds! How about sounds of the mor -sing? THIS IS WHAT REQUIRES TO GET INSPIRED SPECIALLY WHEN YOU GET TENCED UP BECAUSE OF WORK LOAD,FINANCIAL PROBLEMS.AND ETC ETC……..WONDERFUL SITE….PLS KEEP POSTING…THANK YOU SO……………MUCH REALLY APPRECIATED….MY BEST WISHES AND KIND REGRADS TO ALL TEAM MEMBERS….THANK YOU ONCE AGAIN…. just got my dsl connection. I have never heard Jaltarang in Carnatic. It is just lovely. I love this site!!! No postings since long please post something new. I Heard Jaltarang in a Consert…Wonderful..